If fashion were a sport, this shirt would be voted MVP. It’s a classic fit, a color that goes with everything and a casual staple you can dress up or down. Keep reading for our tips to change up your chambray outfits. The freshest warm-weather outfit we could ever dream up? A chambray styled with crisp, white jeans. Chambray is the perfect alternative for our heavier jean jackets once the mercury rises. 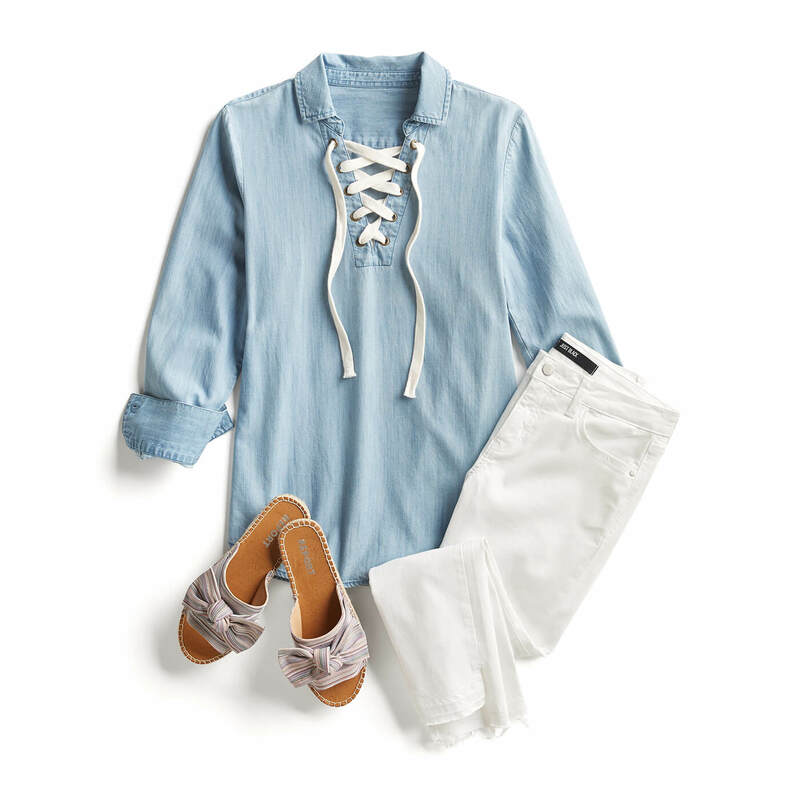 Try pairing your classic (or chambray with a twist) tops with a pair of distressed white jeans and slide sandals for a fresh take on an old classic. Sunny days have us reaching for breathable fabrics that keep us cool all season long. Our favorite alternative to heavier layers? Chambray pants—yes you read that right! Tuck in a patterned top to a wide leg pair of chambray trousers and finish the ensemble with a fresh pair of on-trend summer sandals and a fresh pedicure. Double the denim, double the (stylish) trouble. For chillier nights that call for some added layers, try styling your favorite chambray shirt with a pair of trend-forward jeans (might we suggest raw hem?) and layer with your most-loved denim jacket. Then, just add sandals to keep it appropriate for the warmer months. Warm weather calls for summer dresses. 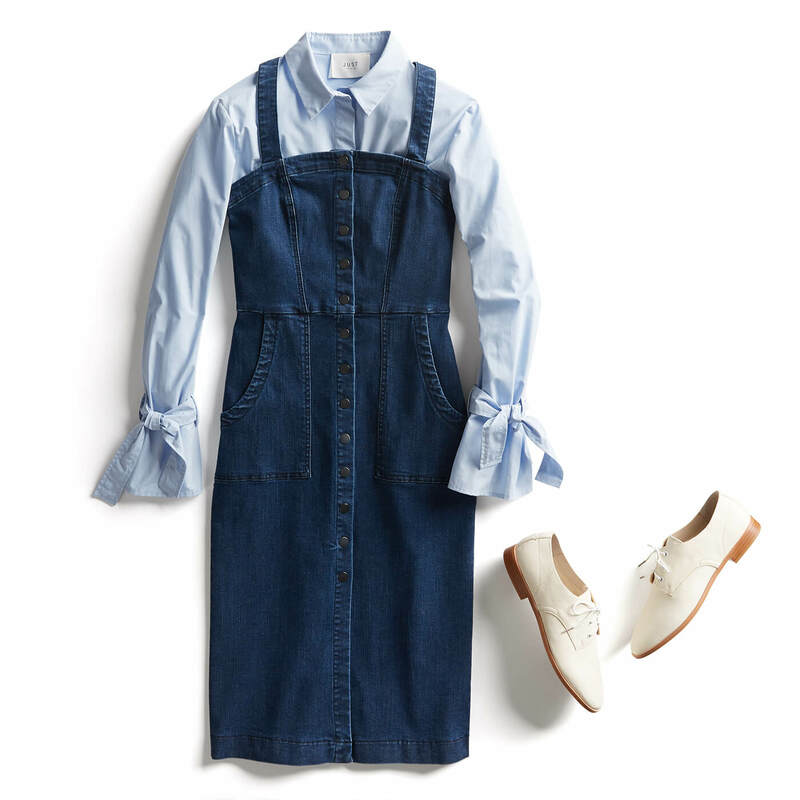 Try layering your favorite chambray button-up underneath a dress this season—whether it’s an easy tank dress or something more jumper-inspired like this one. Just add your favorite sneakers, ankle boots or lace-ups and you’re stylishly set. Are you ready to style chambray? Let us know in the comments below!